Schoolhouse Ronk: I finished it! Finally! I bought this in December to paint for Brian and I finally got around to finishing it. It was really detailed, I think that is why I procrastinated for so long because I just wanted it to be perfect. It has a few imperfections, but I really am happy with how it turned out. It looks great in our office. Now we just need to get the rest of Brian's "I Love Me" wall up and then I need to reupholster that wing back chair I bought last year on my birthday :). 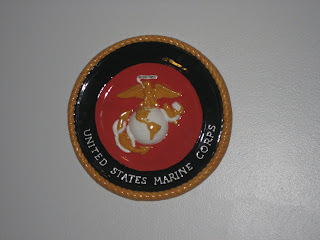 Then our Marine Corps office will really look good. He really did pee on me once. 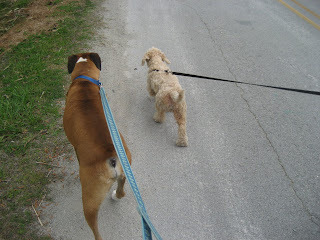 Sometimes when I take them on walks I will pick up trash and recycling that is along the road. So one day I bent over to pick up a pop can and that darn dog lifted his leg on me. LOL. The MC plaque is very nice, alot of detail. Nice job. 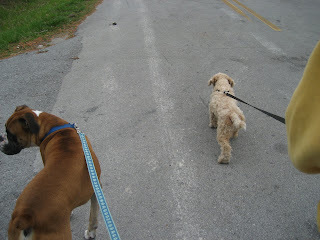 Kimbe and I took Moxie for a walk today too. When we first started out she just tugged on the leash but I kept saying 'heel' and by the time we headed back she finally got the picture :) She just loved going for the walk so my goal is to take her out more too. Looks like Sadie and Tyson liked it too. Love ya! LOL @ Tyson peeing on you!! I actually just had a dog pee on me a couple of weeks ago. I was just minding my own business and next thing I know, he's showering my leg with his urine. I was like, "seriously??? this cannot be happening!" ....so gross! Haha that is hilarious Joy! Especially since it was just a random dog! 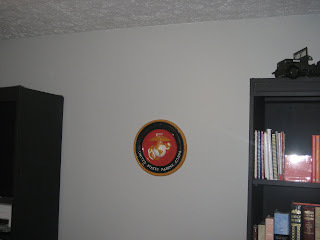 My brother has what I like to call a "rah rah" room, since it's basically his own museum of his Marine career. It's got plaques, Ka-Bars, flags, pictures... Basically 15 years of ... stuff. I love it, but it's waaay too masculine to double as their guest bedroom!